To become a good teacher, you need to be prepared and organized. 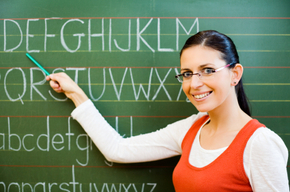 If you will organize your lessons in advance, you will find it easy to convey it to your students. At the same time, students will find their lesson interesting and easy. A disorganized lecture given by a teacher is recognized at once by students and they respond to it in form of losing interest. A good teacher always uses a number of ways and modes to convey what he wants to teach. Some common modes of teaching may include making a group of students. A teacher can use other ways to create interest as well. For example, different books, dance and even music can be used as a mode of teaching. To become a successful teacher, you will need to be patient. Being a teacher, you may have to face criticism by parents and other teachers as well. In this case, you will require being positive towards criticism. Take it as an opportunity to make adjustments and betterments instead of taking it as a personal attack. Teacher should also accept praise and admiration graciously. Show care for your students. You can do this by listening to their problems, offering a compliment, passing a smile or patting them on shoulders. This attitude of yours will create a comfortable and friendly environment and students will become more expressive. They will ask questions with confident and hence will learn new things. Attitude of care and love should also be used with parents of students as well. Address your class as a whole and do not point out a single student. If you will scold a student in front of all others, he will feel embarrassed and will turn against you. If you need to scold a child directly, do it privately. Sometimes classroom becomes a place of tension and anxiety especially when you teach a rigid subject. To handle such classroom situation, use a good sense of humor. Laughing or smiling occasionally decrease distress and anxiety among students. Also encourage your students to join you in this. But make sure that all this should be within discipline and integrity of a classroom. A good teacher never gives up. A successful teacher always encourages his students to overcome difficulties and obstacles. Being a teacher, if you will give up, your students will also find failure as the last option. You should remain positive to show every student that you are confident to do anything. As a result, your students will adopt the same attitude. Their behavioral problems will reduce and entire class will work collectively to attain goals set by you.